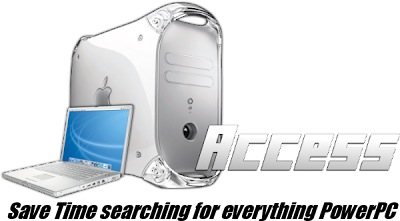 I've just realised I've made this whole site, and not once mentioned how to get a PowerPC Mac. PRETTY SILLY OF ME, but here you go in no particular order. to make sure that you are getting what you're paying for. Ebay is your best option if your looking for a top of the line PPC Mac since there are so many for sell and can be shipped everywhere it's really up to you. This option is usually a lot cheaper since you pick up the computer locally, but you get a vary narrow selection, if any at all of what type of PPC Mac you can get. Only download from the torrent if you have previously purchased he software.